A PAD IN THE STRAW was first published sixty-six years ago in 1952. Long out of print, this new edition retains Lord David Cecil's Foreword to the original volume but now includes a Preface specially written by the author's son, Giles Woodforde, and an Afterword by Richard Dalby — making it the definitive edition of this oft-admired collection of 'strange tales for the connoisseur'. The twenty stories gathered in this volume were originally told by their author as bedtime tales to a group of boys at New College Choir School in Oxford. But Christopher Woodforde was also careful to write them down to circulate among his friends and colleagues. Their favourable reception resulted in their publication as A PAD IN THE STRAW in 1952. Some are true ghost stories, but others play with notions of the supernatural and fantastic, conjuring up impish demons, other-worldly creatures, and everyday objects strangely possessed. Their charm lies in their evocation of an England rich in history, a homely world of the comfortably privileged, abounding in good manners and easy-going bonhomie, yet a world too of hidden influences, of the weirdly unnatural and distinctly uncomfortable. This charm is perhaps enhanced for the modern reader by a pervasive sense of nostalgia in their particular blend of the adventurous and the mysterious. Also reviewed by Mark Andresen at THE PAN REVIEW. (The link will open in a separate window). 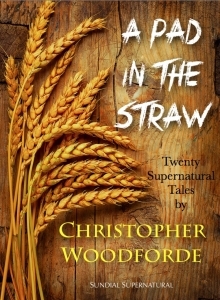 "A recent review of A Pad in the Straw by Christopher Woodforde (published by The Sundial Press) in Ghosts and Scholars resulted in a rush of orders and only two hundred copies have been printed! I ordered my copy via the website (www.sundialpress.co.uk) just after I returned from Cambridge and it arrived first class the following day. How about that for service? It’s a handsome, well-produced, hard-backed volume (with an illustrated dust-wrapper) exactly the same size as the current Sarob publications. Yes, it is perfect bound but at £17.50 (p&p included within the UK) I’m not going to complain about that. The book contains the same twenty stories and prefatory note by Lord David Cecil as in the 1952 Dent original (lowest price on Abebooks, £85) as well as a preface by the author’s son, Giles Woodforde, and an afterword by Richard Dalby which is a most valuable addition. Thus I discovered Christopher’s family connection to the famous eighteenth century clerical diarist and his curacies in Lincolnshire and Norfolk, not far from my current home. Although written for and told to the choristers of New College, Oxford, the tales are not childish and they have a distinctly antiquarian, Jamesian character … "
Reverend Dr Christopher Woodforde (1907-1962) was brought up in Somerset (lovely place that it is, and the fact that I live here does not make me biased in any way), where his antiquarian interests blossomed. He was educated at King's School, Bruton, then went on to Peterhouse, Cambridge, and Wells Theological College. 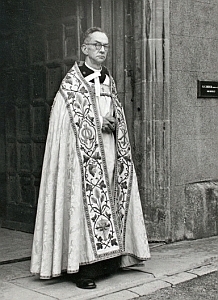 He was ordained in 1930 and served in a number of curacies before becoming Rector of Exford in 1936, and Axbridge (which is not all that far from me) in 1939. In 1945 he became Vicar of Steeple Morden, Cambridge, then in 1948 he was invited to become chaplain of New College Oxford. Finally, in February 1959, he became Dean of Wells; a post previously occupied by another favourite writer of mine, R. H. Malden. Woodforde is best known for his studies of stained glass, which are recognised as definitive works, and his Jamesian ghost stories. A Pad in the Straw, Woodforde's only book of supernatural tales, was first published in 1952 by J. M. Dent & Sons, with drawings and an excellent dust jacket by John Yunge-Bateman. The twenty tales that make up the collection were originally composed to be read as bedtime entertainment for New College choristers; the book is dedicated 'To eight boys who first asked me to tell them a story'. The stories were rewritten prior to publication, though, to make them appealing to a wider audience, so this isn't just a book for young people. They have a distinctly antiquarian, Jamesian character and, as Lord David Cecil says in his preface, 'a waft of the uncanny blows through these tales, just enough to make the spine agreeably tingle.' On the whole, although a few are a little weak, Woodforde's stories are elegant and enjoyable. Several are excellent. In 'Ex Libris', Clive Hopwood's hobby is to collect information and objects connected with his family. His particular interest is in bringing together the library of books once owned by his eighteenth century ancestor, a clergyman who was murdered by a highwayman. He is given a gift by Lord Sulham - a fifteenth century book of accounts that once belonged to the old clergyman. The next day, Hopwood's grandson Aubrey returns to his grandfather's house for morning coffee, only to find him unconscious in a chair. It turns out that the account book has rather more attached to it than family history. 'Lost and Found' is set in and around King's Lynn, where antiquary Henry Selkirk comes across an antique sword that he wants to buy for the Department of Medieval Antiquities at the museum he used to work for. The widow of the previous owner puts Selkirk on to a man called Jasper Christian, who sold the sword to her husband. When he tracks down Christian, he finds that the old man is senile, but Selkirk secures a twelfth century toby-jug from the old man's daughter. Unfortunately, it turns out to be rather blood thirsty! 'Richard' is accompanying his teacher on an outing because it is his birthday. He finds a reference in a guide book to a serpent at a nearby church and asks to go and see it; it is a serpent of the bass wind instrument variety, not a long hissing wriggly thing. They stay out longer than expected, and it is dark by the time they head back to school. I can't say any more without giving too much away, but suffice it to say that I shall never look at a signpost in the same way again - I certainly shan't stand too close to one. 'Jeremy' lives in a top-floor dormitory at number 7, High Street, Grettenham. The second storey of the building is given over to a flat, which is occupied by Theodore Sancroft, a retired senior history master and extremely enthusiastic entomologist. For years, it has been a tradition of the college that nobody should rag Mr Sancroft. Jeremy, a congenital tease, finds out just what happens to young lads who break with that particular tradition. 'The Chalk Pit' is set in the parish of Dunworth, on the border between Hertfordshire and Bedfordshire. Catherine Oving is an academic young lady who has had to give up her education to look after her widowed mother. In the course of making lampshades, she discovers a parchment map of Williamson's Quarry, usually referred to as 'the old chalk pit', which has a reputation for being haunted. She is persuaded to pay a visit to it at midnight with her friend Miss Beauchamp and Harry Granby, a soldier home on leave, and discovers when she arrives that her nephew and his chum have been attacked by 'large things which flew and hopped'. The explanation for the peculiar incident is later discovered in Dunworth Church. In 'The 'Doom' Window at Breckham', Charles Hawthorn is a Wiltshire antiquarian with an immense interest in stained glass, just like Woodforde himself, and railway trains. Having conducted some research into the remains of a scene of the Last Judgement, or 'Doom', in the west window of the parish church of Breckham in Gloucestershire, he has discovered the names of the two sixteenth century glaziers who produced it, both of whom died not long after carrying out the work. On returning home from a trip to examine and photograph the window, he discovers that there are plans to replace it with modern stained glass. But that old glass isn't about to let some aristocratic upstart evict it. I very much liked the mixture of the supernatural and photography in this delightfully antiquarian tale, which is one of my two favourites, along with 'Ex-Libris'. The first edition of A Pad in the Straw is rather rare, and a fine copy in a similar dustjacket seems pretty much impossible to find. A very good copy, with a similar jacket, will cost about a hundred pounds ($160). An Aldine paperback edition was issued in 1964, but that seems just as hard to find, and a reading copy can cost about twenty pounds ($32). 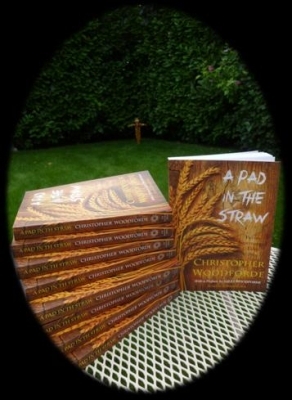 The good news is that The Sundial Press republished A Pad in the Straw last year. The Sundial edition includes the original prefatory note by Lord David Cecil, and adds a foreword by the author's son Giles Woodforde, and an afterword by Richard Dalby. Copies are available from the web site ...To the best of my knowledge, there is no kindle edition out there at the moment. From VIDIMUS the only on-line magazine devoted to medieval stained glass. To read the full article please click here (link will open in a new tab or window).